View From The Summit - ubiq bookshop: the best place to buy books! The first man to set foot on the summit of Everest, the man who led a team of tractors to the South Pole, the man who jetboated up the Ganges from the ocean to the sky has, for the first time, gathered all the remarkable adventures of a long life into one volume. But there is more to Ed Hillary than this. He is also the man who repaid his debt of fame to the Himalayas by inaugurating a programme of school, clinic, airstrip and bridge-building in Nepal which, with his still active support, has gone from strength to strength over the four decades since he himself mastered the Hillary Step and led his companion Tenzing Norgay up Everest’s final summit ridge. He is also the unlikely, but ideal, diplomat who was proud to represent his country as New Zealand’s High Commissioner in India, Pakistan, Nepal and Bhutan, to receive the Order of the Garter from the Queen, and to see his face smiling from the New Zealand five-dollar bill. All this is a long way to come for the shy, strictly raised country boy who went into the family bee-keeping business in New Zealand just before the Second World War but whose real love was for the challenging exploratory climbing routes in his native Southern Alps. Ed Hillary’s strength on ice and snow commended him to the legendary Eric Shipton, with whom he enjoyed some gruelling and at times hair-raising Himalayan forays before being nominated by Shipton for the British 1953 attempt on Everest. 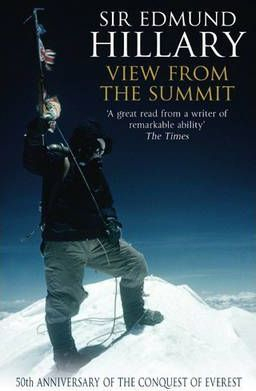 View from the Summit is a thoughtful and honest reappraisal of a life spent pushing human ability to its limits and relishing the challenges thrown down by the elements. It is also the story of a man whom the world has taken to its heart.